Editor’s note: In honor of New Year’s Day, we are rerunning this feature, which was originally posted in April of this year. Happy New Year to all our readers and keep coming back for more in 2010! 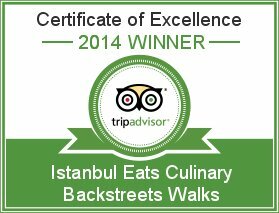 Until we visited some of Istanbul’s shrines to the baked bean, we generally regarded the dish as something eaten out of a can beside railroad tracks. But Turkey takes this humble food seriously; that means chefs in tall toques carefully ladling out golden beans in a rich red gravy onto monogrammed flatware, served by waiters wearing bowties and vests. Even in the least formal of Istanbul’s beaneries, the guy manning the pot has the air of a high priest knowing that his incantations alone conjure something unusually delicious out of a simple dry white legume. This is no hobo fare. The beans at Fasuli Lokantası glow unbelievably orange, as if the chef slipped a little something radioactive in the pot. Whatever the recipe, these beans are among the best we’ve had in Istanbul. Stiffened by a whole lot of butter, the gravy and bean almost achieve the same creamy consistency. The cool crisp raw onions and pickled hot peppers are a welcomed balance to the richness of the dish, although their aroma stays with you long after your meal. Host to a loyal lunch crowd, this white-tablecloth establishment serves up other Black Sea specialties, including muhlama, a sort of Turkish fondue, stuffed chard leaves, and corn bread. 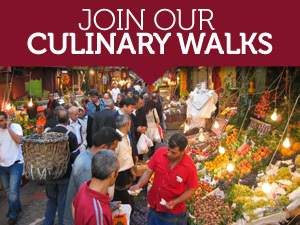 The location, across the street from Tophane’s nargile cafes and near the Karaköy waterfront, is an added bonus. At Çömlek you can’t miss the huge red clay cauldron sitting behind the counter. The fellow with the big ladle says it’s the pot that makes these beans better than the rest. 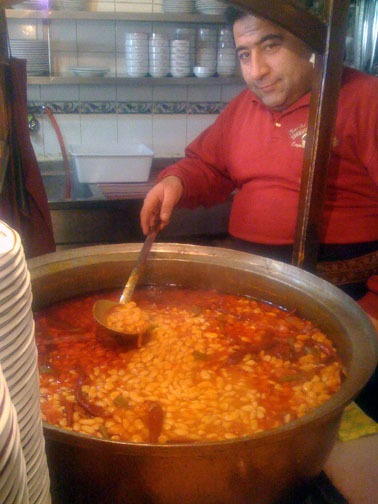 Cooking vessel aside, a serving of these beans also has the highest meat count of any place we’ve visited in Istanbul. Whereas most beans might have a shred or at best a few nuggets of tender roasted beef in there for flavor, Çömlek’s are crowned by generous helping of meat. In such a rich dish the meat offsets the cloying beans satisfyingly, leaving the meek still able to walk away and the strong-willed able order up another half portion. 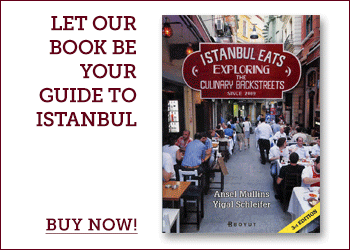 The restaurant, located on the wooded slopes above Üsküdar on the Asian side, is a bit out of the way. But for us, these are beans at their best and worth the trip. According to historians, Tiryaki Sokak – Addicts’ Alley – got its name from the opium served up in its coffee houses in Ottoman times. Though that substance has been long banned, since 1924 Ali Baba has been ladling out something equally addictive from a great copper pot: Erzincan-style baked beans. Ingredients such as onion, tomato and chili pepper are more recognizable in the soupy base, the bean bigger than its Black Sea counterpart. Though we remain junkies of the Black Sea variety, the Erzincan preparation is a nice change of pace and there’s no better place to try a bowl than sitting on Ali Baba’s squat stools in the shadow of the minarets of the sublime Süleymaniye Mosque. For fantastic beans I recommend Bizce Kuru in Ortakoy. I don’t know what they put in them (a lot of butter I think) but they blow away any other beans I’ve had in Turkey. Plus the sides of pickled veggies, yogurt and rice are solid as well. This place never disappoints.